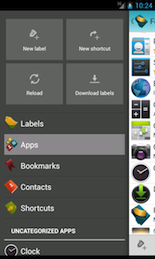 "Folder Organizer Brings Deep Customization to Organizing Apps"
"Folder Organizer – Tidy smartphone, tidy mind!" 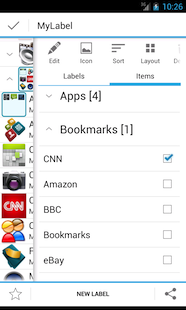 "... provides more extensive features and flexibility than the standard Android 4.x folder function"
Tap on an item (app, bookmark, contact, shortcut or label) and choose labels to use to organize it. 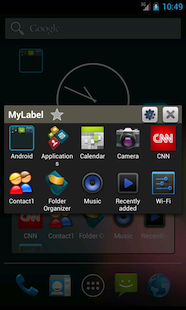 Create a shortcut or widget on your Android home, clicking on it you'll see all the items associated with a label. 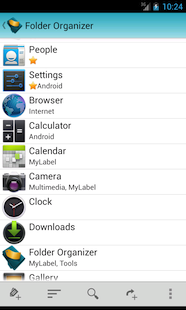 You can create widgets on your Android home (even scrollable widgets if your home supports them). Using widgets you'll have all your favorite items directly on your home! 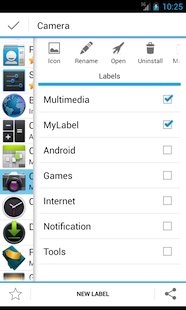 Easy choose items associated to a label, you can choose apps, bookmarks, contacts, shortcuts and other labels using checkboxes. Associating a label to another label you'll create hierarchical labels to organize better all your staff! Powered by WordPress. Built on the Thematic Theme Framework. Created by Fabio Collini.